This is an exciting project with the Hamilton Central School and Madison Central School 5th grade classes conducted at the Leland Reserve. The objective is to have the approximately 45 students in the classes visit up to three times during the course of the school year. Each group will study the habitats and develop seasonal observations into a report to be presented to the other groups near the end of the school year. We also hope to have the groups present to parents and possibly other students at that time. In 2017-18 academic year, the program continues to be a success in its 10th year. We expanded the program to Madison Central School in fall of 2016. We hope to expand the scope of this program to other SMHT properties. The five habitats at the Leland Reserve are: old meadow, shrubland, young forest, riparian corridor and old forest. These are well represented at the Leland Reserve (see guide). SMH T Board members Greg Owens and John Novak are leading this project and provide professional expertise in ecology, biology and forestry. The students and teachers make trips to the Reserve in Fall, Winter and Spring, weather permitting. The groups explore the entire Reserve and the specific study areas are noted. Exploring the stream and planting trees are highlights of the trips. 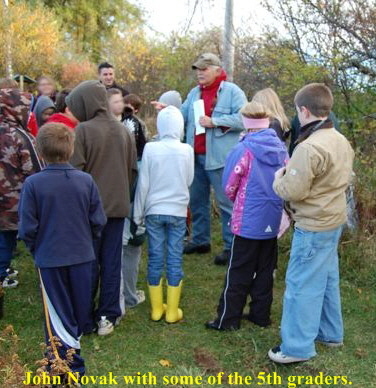 2009 Summary: The 5th grade classes visited the Leland Reserve three times during the school year, Fall, Midwinter and Spring, each time collecting data for their ecology studies. In winter, SMHT provided snowshoes for the 5th graders so they could experience the fun of snowshoeing along with the observations of snow depth and various animal tracks. At the Spring visit, the students saw the first bluebirds and tree swallows exploring the birdhouses. At year’s end, SMHT provided each student with a complimentary green logo tee shirt. A couple of the students rode on the SMHT float in the Hamilton, NY 4th of July parade. Link to report on the parade. 2010 Summary: Again the project proceeded about the same as 2009. The addition in 2010 is a set of five videos prepared by the 5th graders. Each year, board members Greg Owens and John Novak add new ideas and tasks for the students, continually upgrading the program working with the 5th grade teachers. Every spring, the 5th grades receive a logo tee shirt in the color of the year. It’s gratifying to see the shirts around the village in summer. 5th grade classes in their SMHT logo tee shirts June 2009. Every year the 5th graders receive a logo t-shirt.